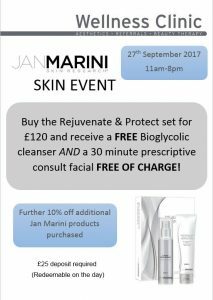 Book in for our Rejuvenate & Protect Skin Event on 27th September. Buy the Rejuvenate & Protect set for £120 saving £14 and receive a FREE Bioglycolic cleanser AND a 30-minute prescriptive consult facial FREE OF CHARGE! Further 10% off additional Jan Marini products purchased. Limited spaces, call 01245 349933 to secure your place. Don’t miss out!